Notes: Compton Castle is a fortified manor house in the village of Compton (formerly "Compton Pole"), about 5 miles (8.0 km) west of Torquay, Devon, England (grid reference SX865648). The estate was home to the families of Compton, de la Pole, Doddiscombe, Gilbert and Templer. The castle has been home to the Gilbert family for most of the time since it was built. It has been a National Trust property since 1951. The castellated house was the seat of Sir Maurice de la Pole in the reign of King Henry II (1154-1189), after which family the manor was known as Compton Pole. The original undefended manor house was built in the mid-14th century and consisted of a hall flanked by solar and service rooms at each end - these were rebuilt in the later Middle Ages. 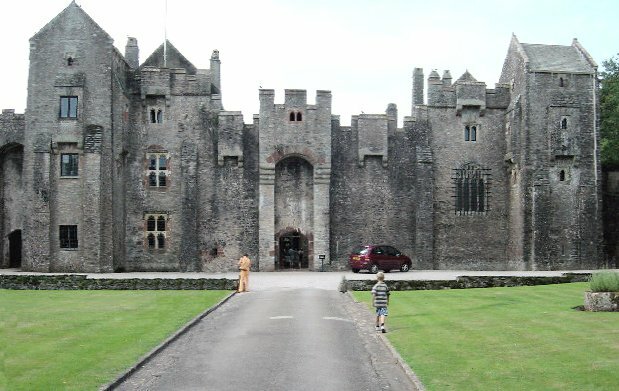 The fortress-like front was added in about 1520 by John Gilbert. The central hall was in ruins by the 18th century, but was faithfully reconstructed in the 1950s.